The second annual Aboriginal Governance Index continued the Frontier Centre project of surveying First Nations residents to discover the true state of governance on Prairie reserves. This year’s index was expanded to survey reserves in Saskatchewan as well as Manitoba, which was covered in the first index. One of the results is that First Nations that receive high scores from their residents for standards of administration also score highly in the Economic section. Correlated scores do not mean anything by themselves. We cannot assume that one is causing the other, or that the two scores are related. It could be that something completely different is affecting both and giving the illusion they are related. 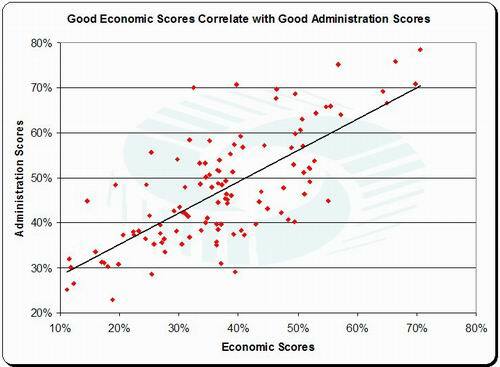 However, in this case, the correlation is very strong (0.73), and it is not difficult to come up with theories that explain why Administration and Economic scores are closely related. The questions on administration focused on the separation of business and political decisions. With this in mind, the correlation makes a strong case that First Nations that are prepared to depoliticize their business decisions are able to deliver better economic outcomes than are those with poor administration.